Multiple sclerosis (MS) is a disease in which the nerves of the central nervous system (CNS) degenerate. The CNS is made up of the brain and spinal cord. They process information from our environment and control voluntary muscle movements to allow the body to do certain things. This neural system works efficiently, unless there is a disease process affecting the pathways in the spinal cord and brain. Multiple sclerosis is one of the diseases that can affect these pathways and results in the destruction of myelin, a covering or insulation for nerves, that improves the conduction of impulses along the nerves and also is important for maintaining the health of the nerves. The demyelination (also known as plaques) disrupts the transmission of information in the CNS and leads to the symptoms seen in multiple sclerosis. The cause of multiple sclerosis is still unknown. In the last 20 years, researchers have focused on disorders of the immune system and genetics for explanations, suspecting that a foreign agent such as a virus alters the immune system so that the immune system perceives myelin as an intruder and attacks it. Definitive proof of this viral theory is still lacking. However, the attack by the body's immune system on the neural tissues that it is supposed to protect is based on reasonable evidence. 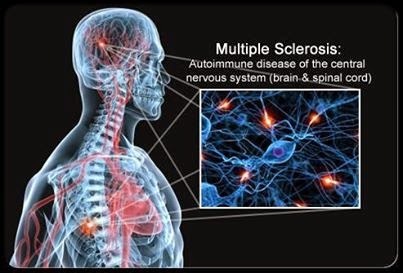 This attack is termed autoimmunity, thus making multiple sclerosis an autoimmune disease.